Shoulder impingement is one of the most common causes of chronic shoulder pain. It is most common in people in their 40’s-60’s. While there can be many factors which contribute to shoulder impingement, eventually it is inflammation in the bursa and surrounding tissues which leads to the pain and dysfunction. Shoulder impingement is known by many other names such as shoulder bursitis or rotator cuff tendinitis, which can lead to some confusion. The most common cause of shoulder impingement is degeneration of the rotator cuff tendons which leads to weakness of the rotator cuff. This degeneration is thought to be an age related problem, but can certainly be accelerated with shoulder overuse. The rotator cuff tendons are very important for stabilizing the shoulder joint and when they become weak, shoulder impingement can occur. Shoulder impingement is typically treated with conservative, non surgical measures to begin with. Approximately 60% of people will improve with a combination of oral anti inflammatory medications, cortisone injections (anti-inflammatory medicine), physical therapy to stretch and strengthen the shoulder, and avoidance of aggravating factors such as overhead use. For those who do not improve with 3-4 months of non surgical management, surgery may be necessary. 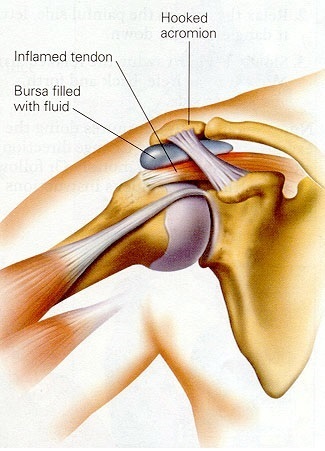 Surgery for shoulder impingement is typically done with arthroscopic techniques. This means the surgeon utilizes small incisions and enters the joint with a camera and specialized instruments. The operation includes removal of the inflamed bursa as well as any bone spurs that may be contributing to the impingement. Sometimes the surgeon will also need to address problems in the bicep tendon, the rotator cuff tendons, or the joint where your collarbone meets your shoulder. An MRI will usually be done prior to surgery in order to better understand exactly what will need to be addressed with surgery. It also gives the surgeon and patient a better understanding of the severity of the disease. The recovery from a surgery for impingement syndrome varies for each patient but typically includes 3-6 months of recovery and rehabilitation to reach full use and function.